Sidney Watson, southwest Louisiana native and fresh out of Harvard Law School, had a mission in 1978: Jump start a legal clinical program from scratch at Tulane Law on a shoestring. “It was something so new, and only a few schools around the country were even thinking about it,” said Watson. By taking the challenge, Watson was a catalyst for a skills-based training program that 40 years later is the hallmark of Tulane’s legal education program and as common as textbook courses in law schools around the country. Hired by Acting Dean Professor Robert Force, Watson distinguished herself because she had studied under an early pioneer in clinical education, Gary Bellow, at Harvard. Along with clinical education, Watson, now a professor of law at St. Louis University School of Law, was also responsible for starting Tulane’s trial practice program. “So I just did what seemed like a good first step: I called local alumni, friends who were lawyers and asked them to help us – by the first year we had 75 students and close to 75 attorneys and judges helping us," she said. Tulane’s extensive alumni network of practitioners and judges, including Julian and Stephen Murray, were crucial to the program’s early success, Watson said. Tulane was one of the few law schools at the time to venture into using live-client experience through clinics and practice simulations, rather than a case book, to teach advocacy skills. “A lot of faculty couldn’t understand how we would teach law without a book. It was unheard of,” she said. The effort was so new, Watson had to sell it to faculty at a time when the case method was the exclusive means of legal education. Her pitch to faculty: This was an opportunity to teach students about substantive law, skills, and professional responsibility in a way that couldn’t be done in the classroom, through direct client representation. The Juvenile Clinic led by Brad Gator and Holly Ackerman kicked things off in 1979, with grant funding to pursue an interdisciplinary approach incorporating social work students. The Civil and Criminal clinics followed, and the program moved into its own house on Freret Street, where it would remain for 15 years until the new building opened in 1995. Watson recalled she needed “the best,” so she recruited Jane Johnson (L'74) from New Orleans Legal Assistance Corp. to run the Civil Clinic and Bette Cole from the Orleans Indigent Defender program to head the Criminal Clinic. Cole and Johnson remember Watson as someone who exuded confidence, despite lacking practical experience. In this way, she modeled for students what clinical teaching is all about. Watson said that, as the clinical experiment grew, the programs had an impact not only on students, but also on the legal system itself. Clinics were engaged in law reform efforts aimed at increasing access to the courts for low-income clients. For example, clinic graduates were some of the first lawyers who had experience representing juveniles in Orleans and Jefferson parishes, Watson said. The early years were full of hard work to build the program, but there also was levity. The “clinic house” on Freret Street operated as much like a clubhouse as a law firm, Johnson said. Students organized social events and happy hours. They gathered to exchange courtroom war stories and blow off steam, and circulated the occasional irreverent newsletter. David Katner (L'80) was in the first class of Criminal Clinic students, having petitioned the law school for skills training with another classmate. Katner took over the Juvenile Clinic in 1984 and still runs it today. The clinics in these early years also provided underrepresented students an opportunity to distinguish themselves. Cole and Johnson remember women and minority students applying to clinics in disproportionate numbers. Judge Felipe Restrepo (L'86) came through the Criminal Law Clinic. 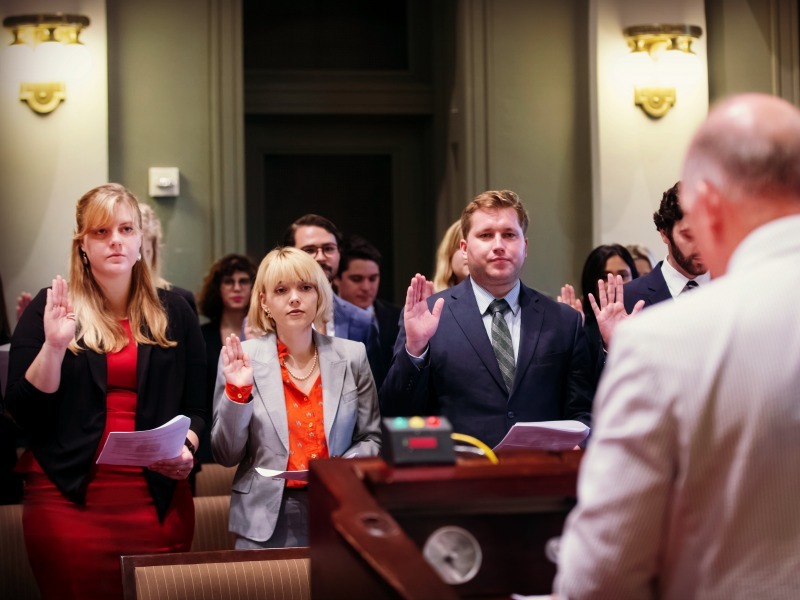 Over the years, clinic graduates have gone on to hold public office, serve as members of the judiciary, manage law firms, and lead public interest organizations. He recalled his first client vividly. Working as a student attorney with Cole, he represented a man charged in an armed robbery case. It was a jury trial and the stakes were high with his client facing significant jail time. Since Judge Restrepo’s days in the clinic, new programs have emerged, including the Tulane Environmental Law Clinic in 1989 and the Domestic Violence Clinic in 2002. Additional client-based practicums and labs in immigration and intellectual property have taken root, alongside a growing complement of externships, boot camps, and simulations. “It’s wonderful to see Tulane as a place where clinical education is part of how the school defines itself,” Watson said. Behind the scenes: Lisa Lamonte, Manager of Law Clinic Administrative Operations, joined the clinics in 1990 and has supported 29 classes of student attorneys, offered a listening ear to hundreds of clients, anticipated faculty needs on a daily basis, planned parties and celebrated birthdays, and successfully operated a non-profit law firm for under-represented litigants with quiet grace and determination.